We all love Eid and the celebrations associated with it. One of the most anticipated Eid celebrations each year is, of course, the Eid marking the end of the 30-day Ramadan fasting.This holiday is sacred, solemn, and celebratory in equal measure. And after the long month-old fasting, it is no surprise that we mark the Eid to break the fast. Following the fast, you’re expected to break bread in celebratory mood with loved ones. So, you should be receiving lots of dinner invites, as well as making some of these yourself, at this time.Eid is typically associated with gift giving and exchanges, and you do not want to go visiting for dinner empty handed. Not only is it impolite to appear at a home dinner empty handed, it also ignores the spirit of the season. But your Eid gifts don’t have to be too expensive to be worthwhile. 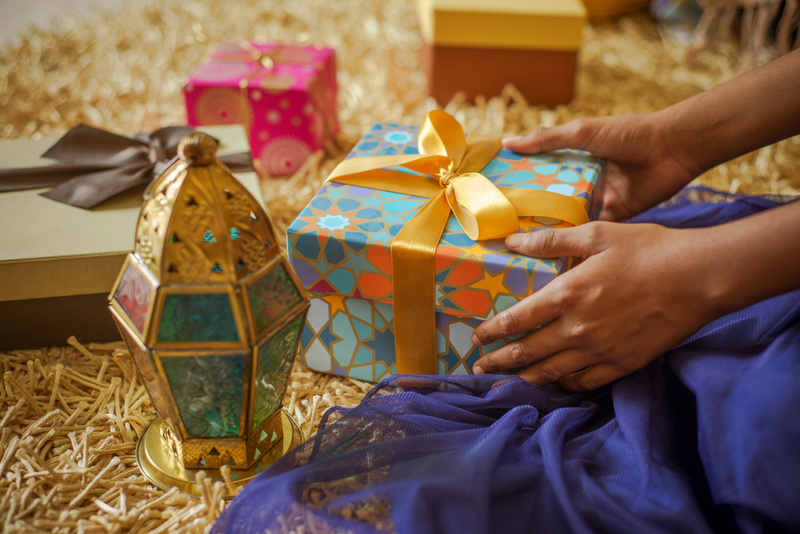 Here, we identify some really beautiful gifts you can take along with you when making an appearance at an Iftar party. Eid is about celebration and feasting. This means that food will always be an important part of any Eid celebrations. Taking along a gift basket of small pastries and sweetsis always a great idea. You can consider throwing in dates, halwas, fruit cakes, juices, almonds, honey, and a few local delicacies into the decorative gift basket you will be taking along to the feast. So, you’re heading off to dinner in someone else’s home; who said you can’t go along with a small meal? It is, after all, a celebration that is based heavily on food and gifting. Bake your hosts a treat or whip up a meal – perhaps an appetizer, desert, or even an addition to the main course on offer. Your hosts are certain to appreciate the time invested into its preparation, as well as your awesome cooking skills. Is your host a lover of all things great art and design? You certainly will be doing no harm if you get them something to further beautify their home. Quranic calligraphy can make for great Islamic gifts. This is an endless pool of options, so take your time to carefully select an artwork that will personally appeal to your hots. Wall tapestries, mason jars, wall decals, and hand drawn art make up some of your options. Pashmina shawls are so enchantingly soft to the touch. Made from a special blend of silk and cashmere, they reek of luxury even before you are able to cup a feel. Have you been invited to dinner with someone special?This gift is one that is sure to let them know just how valued they are.Besides, a shawl is a safe bet when gifting any Muslim woman. Toys are traditionally a part of any Eid celebration, except you make no plans for gifting any children. Interestingly, children receive the most personal gifts during these holidays, so you’d do well to keep them in mind. As with adults, while money won’t be rejected, they are better fascinated by something that engages them. Want them to learn a lesson beyond the season? Find them a toy that is both fun and educational. One of the most interesting food-related gifts you could bring along for the hosts of an Iftar celebration is a produce bouquet. Just like a typical flower bouquet holds fresh, rare and/or beautiful flowers, your produce bouquet could hold a bunch of beautiful greens, herbs, and fruits. This is not only delightful on the eyes, it gets to serve the house for a while even after you’re gone. For a full-on traditional gift, you can’t go wrong with clothing. Whether you are planning a gift for children or adults, carefully selected clothes are always a delight for everyone of every age group. Note that there are cultural differences in the traditional dressing of Muslims around the world, so ensure you stay within these cultural preferences. If unsure, universally safe items like a tie or t-shirt for men, shawl for women, or beautiful tees for kids are always practical.